NETWORK FINALS: FOX’s COLLEGE FOOTBALL game adjusted to 0.9. Elsewhere, the TROLLS HOLIDAY special gained 0.1 in final numbers, while the GRAMMYS GREATEST STORIES special lost the same. CABLE HIGHLIGHTS: Discovery’s GOLD RUSH led Friday cable, down 0.09 to 0.79, with FINDING ESCOBAR’S MILLIONS down 0.03 to 0.34. Hallmark’s movie de jour FINDING SANTA was at 0.67. ESPN had a pair of COLLEGE FOOTBALL games in the Top 10 at 0.61/0.57, and Fox Sports 1’s game was at 0.40. A&E’s LIVE PD dipped 0.03 to 0.60. Nickelodeon’s HEY ARNOLD JUNGLE MOVIE was at 0.40 with simulcasts on Nick At Nite at 0.38, NickToons at 0.03/234K, and TeenNick at 0.04/128K , with lead-in LOUD HOUSE at 0.38 on the mother network, and simulcast on Nicktoons at 0.02/183K and on TeenNick at 0.03/136K. Not to be left out, Cartoon Network had TEEN TITANS GO in the Top 10 at 0.38. On Lifetime, the season premiere of BRING IT was at 0.31, and the season premiere of THE RAP GAME was at 0.27. 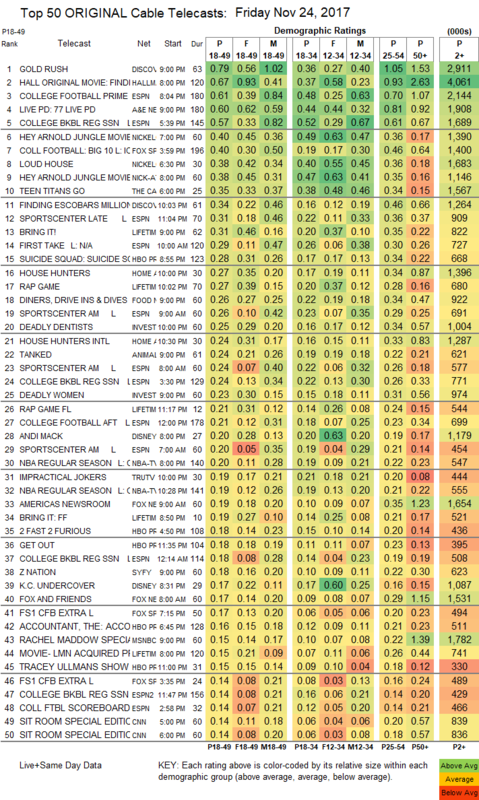 On HGTV, HOUSE HUNTERS dipped 0.02 to 0.27, and HOUSE HUNTERS INTL ticked down to 0.24. Food Network’s DINERS, DRIVE-INS & DIVES dropped 0.05 to 0.26. On ID, DEADLY DENTISTS (no, really) was at 0.25, and DEADLY WOMEN ticked down to 0.23. 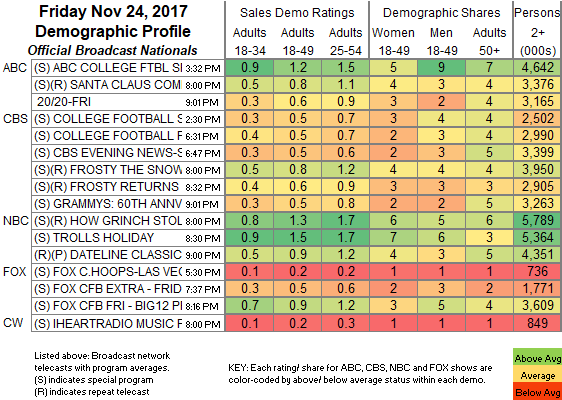 Tru’s IMPRACTICAL JOKERS was at 0.19. Syfy’s Z NATION ticked up to 0.18. HBO’s TRACEY ULLMAN’S SHOW rose 0.06 to 0.15.